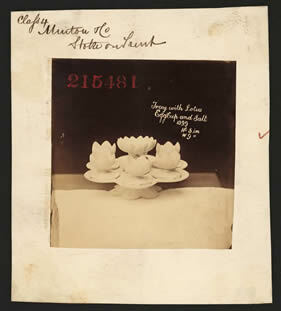 Tray with Lotus Egg Cup and Salt, [Factory shape number?] 1399. Ht. 5in W.9". Note the number 1399 after the shape name in white script on the representation. This is the factory shape number for this particular shape and will normally be found on the base of each item made to this design. See 'Joan Jones Minton: The First Two Hundred Years of Design & Production', Swan Hill Press, 1993, page 352 which identifies this shape as a 'Tray with lotus, egg cup and salt' with the added information that it was designed for majolica glaze decoration.